7 Comments Published by Tiffany on Friday, April 13, 2007 at 7:35 AM. My grandmother passed away in her sleep last night. This was my dad's mom, the one who has had Parkinson's Disease for 15 years. The last time I saw her, for her birthday two weeks ago, she didn't know who I was. Well, she thought she did - she kept calling me Lura Mae, who is a distant cousin who died decades ago. She has thought I'm Lura Mae several times over the last couple of years. This was the grandmother who taught me to sew, taught me to cook, taught me to garden. For most of my life, she never cut her hair, and wore it pinned up every day. Every Saturday she would wash it. It was so long that, to do so, she would have to kneel over the bathtub and let her hair fill it up. I remember thinking she must have been Rapunzel when she was young. She and my grandfather (who died almost exactly 5 years ago) were still madly in love with one another until the day he died. And in fact, when the Parkinson's ravaged her mind and stole her memories, she would forget that he had died, and would have to live through that all over again. Her grief at those moments was almost unbearable. I've never loved anyone that much, I don't think. There are so many things I wish I'd asked her - how she made her okra, her oatmeal, and her beef stew, how to actually finish a quilt and use her quilting frame, how to can and put up jams and vegetables. Her house, that is so familiar to me, is beautifully decorated. It wasn't until the last few years that I've appreciated the quality of furnishings and decor at the farm. She collected a lot of things, but all of them had some beautiful or whimsical value. There's an old crank-phone, two 1940's radios with record players (and my grandfather's hundreds of records dating back to the 1920's), antique furniture handed down from family long ago, and at least 4 or 5 complete sets of dishes - none of them newer than probably 1975. There's a soup tureen and matching soup mugs that look like bee hives. She collected miniature bottles and vases, and set the glass in the window where they would catch the light. She sewed quilts for every room and was meticulous in her cleaning. In fact, when she had to move up to Nashville and physically couldn't help with the housework, it devastated her. She didn't know who she was or what to do without being able to keep the house. She loved God, and every night that my siblings and I would stay at the farm, the night would end with us reading a story from the picture Bible and reciting prayers together. She taught me so much, and has had a great influence on me even today. Her mind has been going for a while now, and I've already been missing her. So today I'm going to rejoice that she is finally whole again, and reunited with the love of her life. Yes, this is the grandmother who accused my sister of getting herself knocked up and my dad of having an affair. All products of the disease, I might add. I think my favorite, though, was this story from last year. I'm so sorry for you. (brush away my tears)... what a beautiful tribute to your grandmother. My thoughts and prayers to you and your family. This was the grandmother who taught me to sew, taught me to cook, taught me to garden. tells me that in no small way your grandmother will be with you here the rest of your days. She's part of the fabric of your life. You're in my prayers. God bless. I'm so very sorry for your loss, T.
My uncle (60 years old) has just recently reached "advanced" stage of Parkinson's and even though we have been dealing with it years already, I know this is just the beginning of lots more tough stuff. My prayers and thoughts are with you and your family, I hope your good memories will comfort you for a long time to come. I'm so sorry to hear about your grandmama. Your memorial to her is beautiful. I know you will miss her physical presence greatly, but the things she's taught you will continue to bless your life. I love you and I'm thinking about your family. I'm so sorry about your loss. Your love for each other is obvious and, hopefully, it will comfort you. You are in my prayers and thoughts. Great memorial here, Tiffany. Please tell your dad that John Hutcheson wishes (as my mom says) to be remembered to him. Just saw this today. I'm so sorry for you. 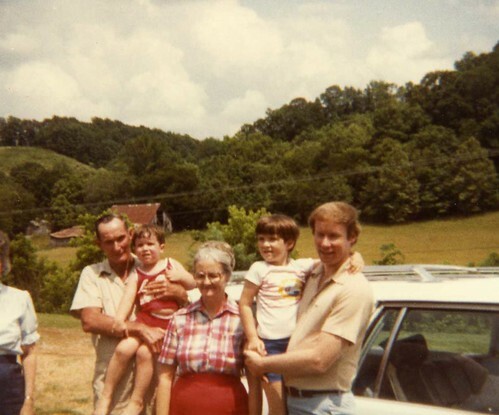 Losing grandparents has a special sort of sadness attached to it.